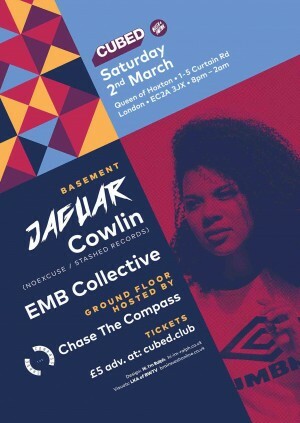 House party energy on the ground floor, taking things a deeper & into the future within the basement, this time around headlined by the very hotly tipped Jaguar! With a supercharged backlog of award-winning radio shows, electrifying mixes and the sharpest eye for cutting edge new music, Jaguar is one of the most impressive and exciting new DJ's to break out onto the UK scene. Whether she is tearing up clubs, hosting her bi-weekly slot on Reprezent Radio or introducing esteemed DJ’s to the world at Mixmag’s Lab LDN, everything she does is with an authentic energy and positivity like no other. This was instantly picked up by the BBC, who brought her on board their Radio 1 and 1Xtra internship and as a member of its esteemed Youth Council back in 2014. Since then, Jaguar has become part of the cornerstone team for BBC Music Introducing, working behind the scenes, as well as hosting events, stages and from this October, her very own Introducing show, on BBC Three Counties Radio. Earlier this year, she also caught the eye of supreme selector, The Black Madonna, who has been mentoring Jaguar as part of Smirnoff’s #EqualisingMusic programme, which saw her secure DJ sets at Lost Village Festival and Printworks, as well as inviting her to appear on her Radio 1 Residency show as a guest. Back in 2016, Jaguar’s efforts were nationally recognised at the Student Radio Awards, when the legendary Steve Lamacq awarded her with Gold Best Specialist Music Programming and Silver Best Female 2016, brandishing her as ‘Radio 1 ready’ with eager promise. Tickets are £5 in advance & strictly limited in number!